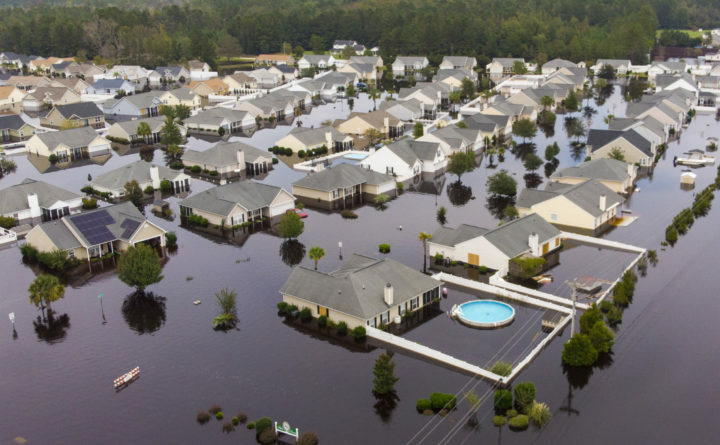 The Polo Farms neighborhood off S.C. Highway 905 is largely underwater, in Longs, South Carolina, due to Hurricane Florence's deluge, Sept. 24, 2018. Tom Mullikin is that guy — you know, the one who finishes Christmas dinner, then takes off to scale Mount Everest, conducting business by satellite phone to check progress on his plan to build an ocean reef upon his return. But first, Everest. If Mullikin succeeds in reaching the summit, he’ll have met his “modest” goal of becoming the world’s only human both to dive the planet’s five oceans and scale its seven highest peaks. Why not? Mullikin himself is remarkably modest given the breadth of his interests and goals — the aforementioned reef not the least of them. The idea, he explained to me over a recent lunch, is to create a coastline buffer that would help diminish the effects of flooding during severe weather. Anyone familiar with South Carolina’s seashore and hurricane history knows that something ought to be done. But what? To answer that question, South Carolina Gov. Henry McMaster authorized a state flood commission last October and named Mullikin its chair. In addition to being an adventurer, Mullikin is an avid environmentalist and eco-lawyer, a pro-business Republican (formerly a Reagan Democrat), as well as a former U.S. Army JAG and the recently retired commander of the South Carolina State Guard. He’s also the creator and leader of Global Eco Adventures, a nonprofit educational organization through which Mullikin takes students and policymakers to ecologically fragile areas for a close-up perspective on global warming, a view best achieved, apparently, from the highest peaks and deepest dives. If you’re exhausted, you’ll find little sympathy from Mullikin — a bald, cherub-faced, gung-ho straight-talk doer who long ago worked for then-Sen. Al Gore and later was a consultant to presidential candidate John McCain, whom he brought to Camden. When I mentioned Gore’s apocalyptic vision of global warming in the documentary “An Inconvenient Truth,” Mullikin responded with the title of his own documentary — “The Whole Truth,” based on his climate-change research expeditions to Africa’s Namib Desert, Peru’s Amazon River Basin and Australia’s Great Barrier Reef. Mullikin is that rare conservative who knows that climate change is real and that human contribution is part of it. He also knows that there’s no way to tackle the problem without a global approach. “We only have one atmosphere,” he says. That China’s toxic emissions have effects elsewhere may be an obvious observation. Less obvious, perhaps, is the State Department’s findings that 70 percent of the mercury deposited in the U.S. comes from global sources. Although climate change isn’t within his immediate purview, the state’s increasing water problems are most certainly related to the increase in severe weather owing to rising temperatures on land and sea. Thus, it isn’t surprising that Mullikin brings a global perspective to local problems. Rather than tackle only the state’s 187-mile coastline, the Floodwater Commission composed of 10 task forces will approach the water problem comprehensively, addressing everything from shoreline plantings to ditches, canals, rivers, estuaries — any place where water accumulates — as well as beautification and development adjustments, such as permeable surfacing materials. Charleston, the state’s largest city, has taken measures to prevent future damage to the historic peninsula by constructing a tunnel system beneath the streets to channel water and also, possibly, a seawall. But those efforts won’t help other coastal and smaller inland communities that often suffer the worst flooding. The proposed artificial reef system is the most dramatic part of the mission, involving the sinking of defunct naval ships, among other ramparts, that would become the foundation for ocean ecosystems, while also reducing flood events through wave breaking and wave-energy dispersion. Other task forces comprised of a who’s-who of South Carolina experts, policymakers, legislators, scientists and military leaders will address living shorelines, infrastructure, “smart rivers,” grid security and, not least, national security. Perhaps most important is the task force on stakeholder engagement. The real makers and breakers of this particular deal are everyday people whose ideas and contributions will be sought by mayors and task-force leaders. All hands are needed on deck, says Mullikin, if the state is, indeed, to shift the tides — or at least tame the waves. In the meantime, assuming Mount Everest’s hospitality, Mullikin vows that South Carolina soon will be first in the nation in environmental protection. Kathleen Parker is a columnist for The Washington Post. Her email address is kathleenparker@washpost.com.